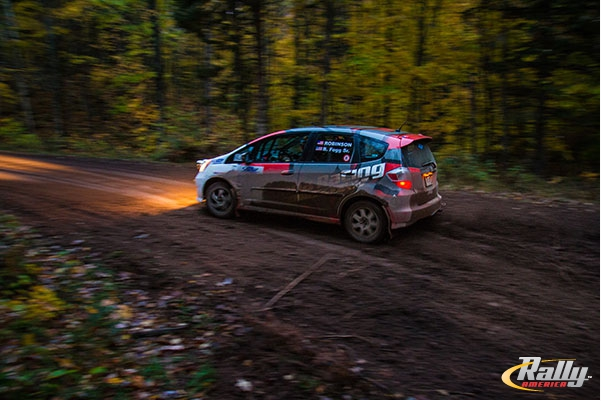 Team Honda Research partnered with Honda Performance Development to showcase the B-Spec Fit developed specifically for Rally competition at the Lake Superior Pro Rally (LSPR), the seventh and final round of the Rally America National Championship. Moving into the final National Championship round, the B-Spec Fit was already assured of the Manufacturers’ Championship, based on its strong finishes through Round Six. With the B-Spec drivers’ and co-drivers’ championships also locked up over the second-place Toyota team, LSPR would promise to be an exciting, albeit somewhat relaxing, event to finish the 2013 season. With nine stages to contest on Day One, the Fit set off with the new team of James Robinson and Bill Fogg Sr. “Our goal for this event is to give Bill a chance to see Rallying from a new perspective, and to also have a great time!” James said. The full THR crew came to support the last-round effort, so there was plenty of support to keep the B-Spec Fit running strong. Despite a wild weather mix of sun, rain, and sleet, the B-Spec Fit continued to gain speed and confidence. “I think we’re both having a great time today, and it’s a good opportunity for us to yet again showcase the reliability and adaptability of the Honda Fit,” Robinson said at the second service of the day. By the final stage, the B-Spec Fit had built up a solid 10-minute lead over the second place B-Spec Toyota. “Bill has helped us to keep our pace up over the last eight stages, and this puts us in a great place for wrapping up the 2013 season,” Robinson noted.